A condo hotel, also known as a Hotel Condo(Hotel-Condo), or Condotel is a hotel where some or all the rooms have been legally transformed into condominium units which are sold to property owners, and where it is intended that the condominium units will be part of the hotel’s inventory of rooms to be rented to the public and operated by the hotel management. Condo Hotels are frequently located in high end ski resorts. Condo Hotels located in Big Sky include the Summit Hotel, Shoshone Condominium Hotel, and the Big Sky Lone Peak Center Condos. Condo hotels have rooms that are sold to individual owners who may use their unit as a vacation home whenever they like. When they’re not using their unit, owners have the option of placing it into the Big Sky Resort rental program(Big Sky Central Reservations). Rental revenue, which is shared with Big Sky Resort, helps defray the owner’s expenses. 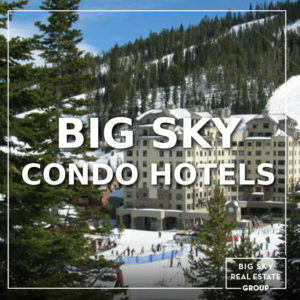 This arrangement allows the owners of the condo units to leverage the marketing and management done by Big Sky Resort to rent and manage the condo unit as it would any other hotel room. Owners typically pay no upfront fees for rental management, which includes the marketing and reservation of the units. Condo hotels offer hassle-free vacation home ownership. The on-site management company takes care of all marketing, reservations, accounting, maintenance, security, housekeeping and concierge services throughout the year. All guests and owners receive complimentary access to swimming pools, health clubs, and tennis courts. All guests and owners may utilize 24-hour dedicated safety & security personnel, front desk staff and bell services. Additional benefits include: Ski storage service, Two private owner lock-off spaces, Complimentary in-building valet parking, Slope-side to the Biggest Skiing in America at Big Sky, In-house laundry facilities and dry-cleaning, Outdoor ski storage services, Complimentary turn down service and robes. Condo hotels units are fee simple deeded real estate, and can be bought and sold like other forms of real estate. Financing is generally costlier than for a primary residence and mortgage rates may be a full point higher. Owners may have to purchase extra insurance to protect against liability claims and some types of damage or loss. Condo hotels combine vacation home ownership with investment potential. Owners of Big Sky condo hotel units have the right to resell their unit at any time. They keep any profits derived from appreciation. Like traditional real estate, appreciation of the property is never guaranteed. Revenue splits between owners and Big Sky Resort hover around 50 percent which is inline with Condo Hotels in other ski resorts. As with most condominiums, owners of condo-hotel units are required to pay homeowner’s association fees, commonly referred to as HOAs. Because these condos operate as full service hotels, HOA(Home Owner Association) Fees are substantially higher than other condominium units in Big Sky. Analyzing the economics of a condo hotel unit in Big Sky is difficult. While it is possible to obtain rental history for most units for sale, calculating potential income as part of a Capitalization Rate analysis is more difficult due to seasonality of rental demand for these properties in Big Sky, differences in owner usage days, and special assessments to owners via the HOA(Home Owners Association) for updates to FF&E (Furniture, Fixtures and Equipment). Items related to hotel guest impact are generally not included in the HOA fees, these would include housekeeping, and costs related to hotel staffing and operation. These are commonly referred to as Day Use Fees.